They are accused of harming wildlife. But, far from killing tigers, many tribes worship them as gods and take care of their environment better than anyone else. 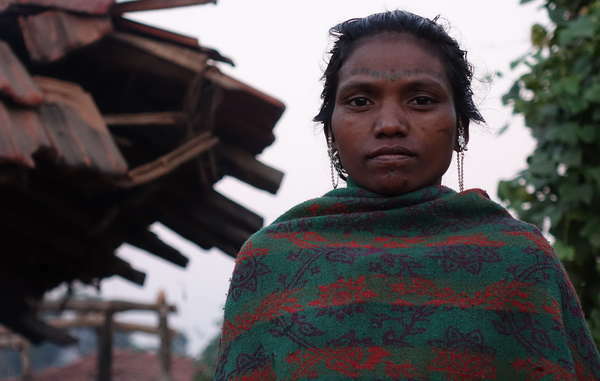 Baiga woman from Rajak village, threatened with eviction. The villagers are determined to stay and say they don’t want to leave their forest. Achanakmar Tiger Reserve. 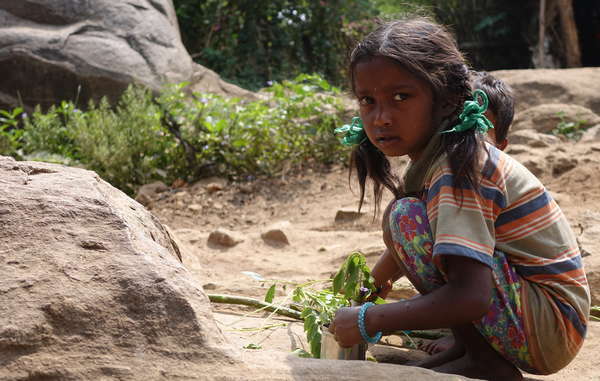 India’s tribal peoples have lived with and nurtured the unique flora and fauna of the Indian jungle for centuries. 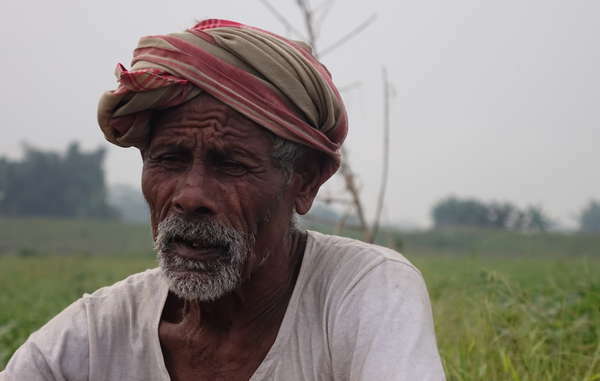 “We all have been living together as one: the forest, the animals and the tribes”, a Jenu Kuruba man said. It’s no coincidence that so many tribes live in tiger reserves: They know how to coexist with the tiger, and they have carefully managed and protected their environments for generations. They are the best conservationists and guardians of the natural world. The forests are the home of gods and divinities for the tribal peoples. Jenu Kuruba have sacred places in the forest where they worship small statues made of mud. Mising tribes worship the river, sending out boats made of banana leaves containing offerings for the river deity. Mising house. 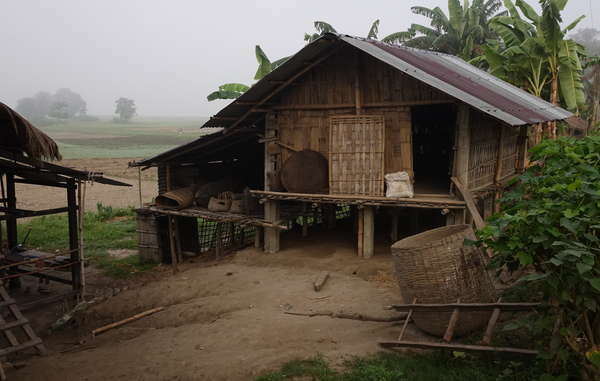 There have been evictions of tribal people from Kaziranga National Park over the last 100 years, some villages have been displaced more than once as the park has grown. Six additions have been made to the park which now face eviction. Despite the thick and rich vegetation, tribal people do not need maps. They have an extraordinary and intimate knowledge of every tree, rock, or stream. Soliga know 45 different leaves just for use in cooking. They identify the smell of individual animals. They can deduce the temper of an elephant from the way it holds its trunk. Most tribes have small fields for crops and collect fruits, roots, vegetables and honey, a favorite treat. (The Jenu Kuruba like honey so much that their name means “honey gatherers!”) Others live by fishing or, like the Mising, graze animals. Many tribes such as the Baiga and Soliga used to hunt and carry out shifting cultivation, until both practices were banned. For the Baiga, tilling the land with a plough was anathema – “like scratching the breast of Mother Earth.” Now they are forced to practise settled agriculture. 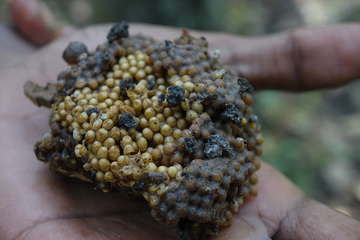 Honeycomb collected by Chenchu men. 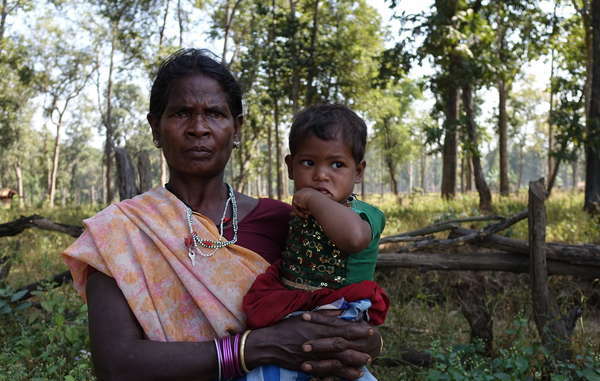 Baiga woman evicted from Kanha Tiger Reserve. Despite the claims of many conservationists, for tribal people, wildlife is not a threat or a danger. They laugh at the suggestion they are frightened of the tiger, telling us they have always lived together. Many tribes, such as the Chenchu, worship the tiger, considering it both a god and a member of their large spiritual family, which includes other animals such as panthers and bears. For others, such as the Baiga and the Mising, the tiger is seen as a companion with whom they share the forest. The Soliga explain that they are not scared when they come across a tiger. Even a Soliga child knows just to call it a “big dog” – apparently this insult is enough to drive it away! Soliga child. BRT Hills Tiger Reserve. Thanks to this acceptance of the tiger, the animals are thriving in areas where the tribal people have not been evicted. A recent census has shown that the number of tigers in one tiger reserve has increased way above the national average since the Soliga became the first tribe to have their rights to stay in a tiger reserve recognized. Evidence proves that tribal peoples are better at looking after their environment than anyone else, and therefore the best placed to protect the tiger and its forests. 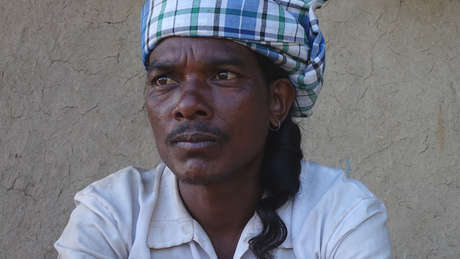 In spite of this, current conservation practices threaten to destroy India’s tribal guardians and their natural heritage by illegally evicting communities from their ancestral homelands and criminalizing their subsistence activities. Mising man. Kaziranga National Park.